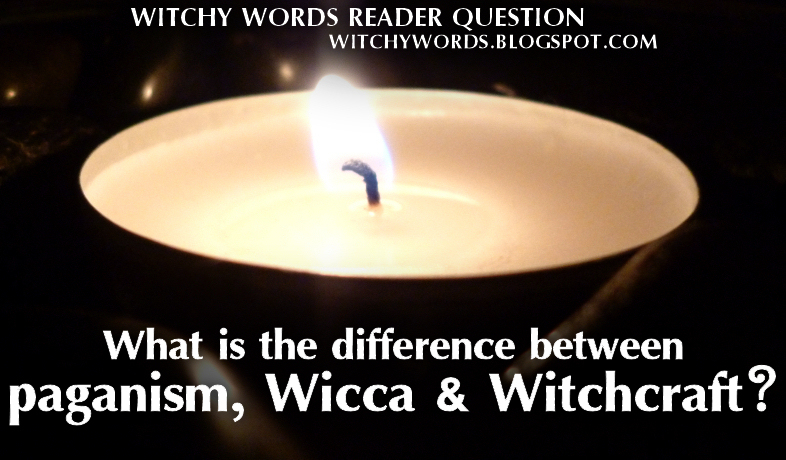 Witchy Words: Reader Question: What is the difference between paganism, Wicca and Witchcraft? This is probably the most frequent question I've received, so I'm surprised I haven't touched on this subject sooner! I did cover "How do I know if I'm a witch?" here, but it doesn't specifically address the differences between Witchcraft, Wicca and paganism. To answer the question most directly, paganism, Wicca and witch are all completely separate terms with a variety of meanings depending on your denomination, beliefs and research. All Wiccans are pagans, but not all or even most of pagans are Wiccans. Some pagans are witches. Some aren't. Some witches are pagans. Some aren't. Confused yet? Don't be! Paganism is a term for all historical pre-Christian earth-based religions, mostly referring to indigenous peoples and the classical world. Neopaganism or contemporary paganism, often just shorted to paganism conversationally nowadays, is a modern religious movement of paths influenced by historical paganism. Modern paganism becomes an umbrella term for many different paths (much like Christianity is for the many Christian faiths). Paganism can be many, many things, ranging from Asatru to Wicca, Satanism to Christo-Pagans and even Techno-Pagans. Some pagans pull from many different belief systems to suit their personal and spiritual needs. These pagans refer to themselves as eclectic pagans (Eclectic - adjective - deriving ideas, style, or taste from a broad and diverse range of sources. [Source]). The truth is that there are so many different forms of paganism that it becomes hard to define just what it is, but that gives you a generalized description to sort the differences. Wicca is an incredibly modern denomination of paganism originating in the 1950’s by one Gerald Gardner which, at its strictest core, blends European pagan folk traditions with 19th and 20th century occultism. Wicca is usually, but not always, dualistic in beliefs with a God and Goddess, sometimes represented by classical pagan gods and goddesses. Until the 1970’s-ish (that’s a technical term there), you typically couldn't be considered Wiccan unless you were initiated formally into a British Traditional Wiccan coven - a coven that can trace its roots back to some of the first forms of Wicca, such as Alexandrian or Gardnerian. Self-initiation became an important part of Wicca as the religion gained popularity but was still considered socially taboo, making it hard for individuals to find covens while still wanting to practice their beliefs. Today, self-initiation is generally accepted. Witch itself is an independent term referring to the non-religious practice of the manifestation from the interconnectedness of the world a particular intent, in the most broad and general terms. It is not a religion, hence why it's referred to as a Craft, but it can be incorporated as a component to religion if desired. Or, if you don't have/want a religion, you can simply practice Witchcraft as it is. It all depends on your personal belief system. The reason it's so hard to define paganism, Wicca or Witchcraft is that there is no one book to outline the beliefs. Unlike Christianity which has the Bible, or Islam which has the Qur'an, or Judaism which has the Torah, Paganism is so incredibly diverse and covers such a wide range of topics that it would be quite literally impossible to narrow it down to just one text as the basis of all beliefs. To make it even more difficult to define, neopaganism, Wicca and Witchcraft are all generally built around the individual rather than the group. The idea is that that we are our own spiritual mediator and that we can create our own churches by will with as many or as few people we like in as big or as small of a space as we prefer. It makes paganism, and thus Wicca, incredibly personal religions, and Witchcraft an incredibly personal practice. We are allowed to shape our own spirituality, and thus no single book can define every person's individual views. Use this article as a means to fuel your own research. These are my definitions based on my own research, but there are so many wonderful resources out there that may give you different or clearer definitions! Try checking out my personal reading list for a starting point. Best of luck to you! Thanks Marietta, that is very lovely and clearly written! I often struggle to explain to interested people what it is all about, I really loved your Venn diagram, it helped! Thank you so much! I'm so glad I could help! The most beautiful explanation I've ever read. Perfect! Nailed it. Love your visual aid. Nice work. While I like your diagram and most of your article, I must highly disagree with your definition of Pagan. It really isn't as nebulous as you present it. Traditionally Pagan has been anyone that is not Judeao-Christian-Islamic. Only recently in the past decade or so has any change in that definition come about. It is also much simpler to remember. Also, Satanists are not Pagan as they typically believe that Jesus was the son of God and so fall into a subset of Christians. Satanists who argue they don't believe in Jesus and are only into the personal power aspect are more like Objective Humanists. Also, if you chose to do magick (k to distinguish from stage magic/illusion) as a Christian then you are not Pagan, you are simply a Christian Mystic and there are several varieties of those. So, other than that, I like your article as it presents a concise and accurate view. The only reason paganism is traditionally is anyone who does not fall under an Abrahamic religion is purely because Abrahamic texts state that anyone who does not believe in the "one true god" is a pagan. That gives an awful lot of weight to Abrahamic texts in defining who we as pagans are. However, you'll find that many Buddhist do not consider themselves pagan. Hinduism, no matter how pagan-esque it may seem, is not pagan. Both are associated with Indian (geographically Indian, not Native American) religions and most Buddhists and Hindus would not consider themselves pagan. What about Eastern Asian religions, such as Shinto and Taoism? Would you consider those pagan? Would they come to a modern pagan gathering? The list goes on. By accepting the Abrahamic religions' definition of pagan, you are negating a number of religions who do not classify themselves as pagan either. Beyond that, I found that I couldn't simply define paganism by what it is not because that becomes incredibly confusing, especially as the list of what is not pagan is particularly long. Most dictionaries, encyclopedias and other such references are going to give a variation of the definition I gave above in referring to modern paganism. I find that I don't necessarily disagree with it. But again, note the disclaimer towards the bottom of the article that references that this is my opinion on the topic and should do nothing more than fuel your own research. As for Christian-influenced paganism, such as Christo-Wiccans and Satanists, the lines become blurred and I certainly stepped on the mouse trap of controversy that these two forms of religion offer. That's what happens when religious influences mix, and that mixing of influences is quite common in modern society. Honestly, I could probably create a whole different circle for Christianity and then create an overlapping circle between Christianity and Paganism for those terms. I know a number of Christo-Wiccans and Satanists that come to the public Liithi Lushede rituals here in Kansas City and worship as pagans. That is their choice to do so and I don't really believe that anyone can tell them that what they believe or where they think their beliefs lie on the spectrum is wrong. In the end, it's up to the individual to decide what is right for them and no one else. Finally, your definition of Satanism negates a number of Satanist denominations and stereotypes them as into the "personal power aspect," which I think they would likely find highly offensive. Satanism includes a variety of pagan beliefs that readily help it fall into a more pagan definition and many of their practices are based on non-Abrahamic texts. Only a part of Satanists are Theistic Satanists that believe in Satan/Lucifer as a deity and, should we take your definition as the true definition, we are telling Non-Theistic Satanists that they should reclassify themselves. Also, there are a number of neo-pagans that believe that the Christian deities exist alongside pagan deities and can be called upon in their works. They believe in Lucifer/Satan but are not Satanists or Christians. So are their belief systems invalidated? I don't think so. I can only speak on a broad term since I am not a Satanist, Christo-Wiccan or any other non-pagan, non-Abrahamic religion. Again, use this information to spur your own research! And thank you again for commenting! I so agree, thank u so much for the info. I am a Pagan which believes in the Wiccan way and it is offensive to me, that we are often put in sections with Satanism, we do not believe in Satan in any form because for us Christians are evil, we as a group of nature survivors were almost wiped out by christians and this story we will never forget but we also believe in no harm to none. Blessed be. Absolutely agreed, Kate. Did you know that, historically, many pagans willingly and happily converted to Christianity? The real reason behind many of our icons being used in Christian holidays is a simple overlapping and intermixing of traditions. Christians aren't "stealing" anything. Pagans brought it with them when they converted. My husband is Catholic. He takes pictures for my circle's rituals. I don't think he's evil. Finally, as a Wiccan, you may not believe in the devil/Satan/Lucifer, but some other Wiccans and pagans do. I'm surprised you find it offensive that someone else believes in something you don't, then talk about how "evil" Christians are for supposedly doing the same thing. We're not here to judge others by their beliefs. Overall, good article. I would have to agree with Kerian Stardragon on the Pagan definition thing. Also, the tendency to use Wicca and Witch interchangeably ( and / or synonymously ) is another problem that needs to be addressed because they aren't, and shouldn't be. While yes, you can have a Wiccan Witch, to say that you are simply a witch dies not also say you are Wiccan ( by definition ) however the newer people to the path are blurring the line, and bucking correction along the way. Thank you for your comment! I would suggest taking a look at my response to said comment above as it covers much ground on that topic as to why I didn't define paganism as any non-Abrahamic religion and where Christo-Wiccans/Satanists lie on the spectrum. As for the separation of Wicca and Witch, I had hoped that the diagram and the separate definitions would be enough to clearly denote there is a difference between the two but you're right. I did not stress it. It's something I will go back at a later time and emphasize more clearly. On a Dutch facebook page about traditional Wicca someone shared this blogpost. Some people were a little suprised to see that people actually think this article is making things clear. There are several errors (imho) i would like to mention. At first; Wicca is the Witchcraft, nothing more, nothing less. The Wicca is not a branch, or a form of witchcraft. I think it was in the fifties or sixties the tradition was mentioned as Wicca (Wica) before that it was just the Witchcraft. Also not every priest/ess of the Wicca is a paganist. In fact you can be just as well a christian or muslim. Working with pagan deities or celebrating pagan festivals doesn't make you a pagan. Just as going to church doesn't make you a christian and celebrating the Durga Puja doesn't make you a hindu. A part of Wicca that is totally invisible in your explanation is that the Wicca is a branch of Western Mystery Tradition with a lineage to the Golden Dawn, strong influences from Aleister Crowley and with her roots Gnostic mysticism. The structure of our tradition is based on this Hermetic tradition of magic. Also the Wicca is absolute, without question marks, an initiationary tradition. Self-initiation doesn't exist. You can dedicade yourself to a task, quest, or to a deity, but you can not initiate your self, that's practical impossible! So there are no self made, or self-initiate Wiccans. I do understand that it's difficult to find correct information, there is so much written on the internet and so many books are written since the nineties, so maybe the information i give you can bring some new light on your study. I pretty much stopped reading your comment when you implied that Wicca and witchcraft were the same thing. They're not. You're assuming that Margaret Murray's witch-cult hypothesis was correct when it was been completely and utterly denounced. It was this witch-cult hypothesis, along with elements of Golden Dawn. that led Gerald Gardner to create Wicca. Wicca is a modern religion stemming from the 1950s. To suggest it's older is to denounce its origins entirely. I am a Solitary Witch. By Christian definition, I am Pagan. I am not Wicca, I have never desired to be initiated into any group. It's as simple as that. I agree with everything you've said - I'm Pantheistic Pagan and a Witch. The two are separate in my mind; the spiritual side is an expression of how I feel that I can contact the Divine, the Craft is a part of me, a part of my personal creativity . All humans have the ability, but only a few are willing to train themselves to use it. Hi. I saw this diagram circulating on Facebook and a bunch of non-Wiccan witches celebrating the depction of non-Wiccan witchcraft, but overlooking something vitally important. I liked our article and mostly agree with your definitions, but your diagram is off, and I thought that I would point it out. 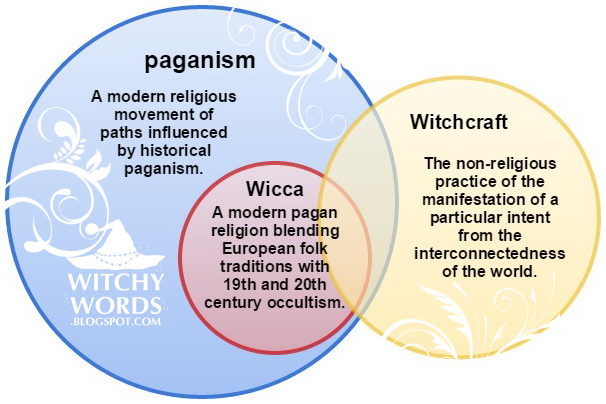 Wicca accurately belongs completely within the overlap between witchcraft and paganism, but would not take up the entirety of that space, since there are many of other forms of pagan witchcraft, such as Tubal Cain, Cochrane witchcraft, Feri, Stregaria, etc... Wicca is both pagan and witchcraft, so the idea that some of it isn't witchcraft is a little silly, since the word used for the tradition, Wicca, translates to "witch" in modern day English. One cannot be Wiccan without practicing witchcraft. I found your beautiful vinn diagram on Instagram and using it found your blog. I have felt drawn to witchcraft since I was a teen. Later I became a Christian and after several years left religion behind. But I love and am drawn to the craft. I am not pagan because I do not worship god(s), I am not interested in Wicca because spell crafting does not resonate with me. But your definition on Witchcraft does. So beautiful! It feels like home. Plus, I am really enjoying your blog and wish I had a community like yours! I very much strongly disagree that Wicca and witch are the same thing. Wicca was formed by Gerald Gardner in the 1950s and is not the same as witchcraft. There's a ritualistic and religious aspect to Gardner's creation that isn't necessarily found in witchcraft. AS for whether or not Wicca always falls within witchcraft, I'd also have to disagree with that. While Gardner founded Wicca to incorporate elements of traditional witchcraft and folk magic, there are paths that have strayed away from that. If we ignored any path that didn't adhere to Gardner's original creation and version, we'd eliminate nearly every tradition out there, including solitary Wiccans as Gardner's version was purely initiatory. The evolution necessitates the change. It's a debate based on research i suppose, i don't fully agree nor disagree, Gardner put his own spin on it and had it published but Wiccan and Witch have been around long before Gardner was. While i agree that Wicca and Witchcraft are not entirely the same thing, the words come from each other (or so i have found on the net) but the difference depends on what and how you practice the craft to which category you would fall under. I agree that if we only listened to Gardner's version of being a Wiccan, would mean ignoring many other paths. Covens were created to increase the power of the coven as a whole for certain rituals etc but while being part of a coven the members practiced individually anyway. I have heard people say that solitary witches or self initiated witches are not a thing, this i totally disagree with. Otherwise where did the first witch come from? While i have my own opinions on the topic, i am still new to the craft part of things and still doing my own research into the subject and have found your articles to be helpful. Thank you for replying. The suggestion that Wicca existed pre-Gardner comes from Margaret Murray's Witch-Cult hypothesis, which has been largely discredited, and from Gardner's own bolstering of his credentials, of which has also been discredited. It's not to say that Wicca isn't a fantastic religion, but the realities of its creation must be fully accepted. Solitary witches exist just fine. It's solitary Wiccans that are up for debate because Wicca was meant to be initiatory. According to some traditions - specifically those that fall under British Traditional Wicca (BTW), Wiccans absolutely must be initiated into a coven. Modernization, I feel, has changed that requirement, particularly with authors like Valiente and Cunningham paving the road for self-initiation and solitary practice. I am a witch and I do not identify as Wiccan. For me, Wicca is a religion. What I do as a witch is not a religion but a skill set or a practice. You'll find that most witches do not see Wiccans as being the same and will be frustrated with the confusion of the two. I have been a Wiccan for over 20 years. Wicca is spirituality and withcraft combined. A belief system that brings both together. The pentacle clearly represents this. Regardless of whom made it popular with their own interpretation, i.e. Gardner or whom shed more light into the belief system, i.e. Cunningham, it is the unifying concept of both spirituality and witchcraft that it represents. Regardless of whether one chooses to be part of a coven or a solitary, the belief system is what defines it. Identifying oneself as a Wiccan means that one practices both spirituality and witchcraft with the Wiccan Rede as a guide. As a person who's getting involved in this magic and wonderful world of beliefs mostly based about Nature and symbols i find this post really helpful and easy to read. Thanks for sharing. Hey everyone! 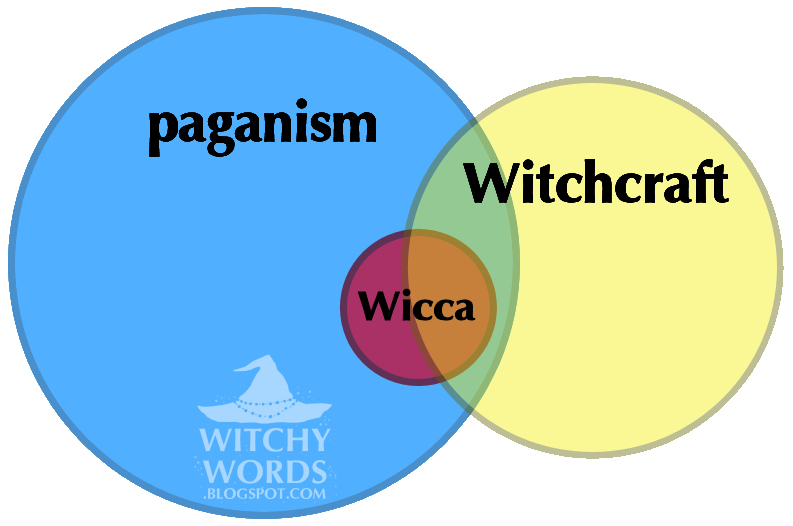 I'm sorry to bother you but I don't really get the difference between Paganism and Wicca.. Could you please explain it to me? If a person saiy "I'm pagan but not a wiccan" what does that mean?